WHAT DO THEY SAY ABOUT TLC TOURS? "The best tour I've ever taken!" "Well, what can I say? We had the MOST amazing time! It was just wonderful in every way. We went to amazing places, sang everywhere and met the fantastic Irish people. A cappella Gold and friends still talk about it today. Thank you Leo for awesome memories that will last a lifetime!" 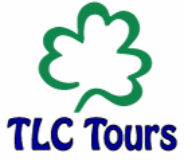 ​"We had an amazing adventure thanks to you and TLC Tours. Everyone had an incredible time. We couldn’t have asked for anything more. The accommodations were high-end; so nice, spacious and comfortable, the Coach and Driver/Guide fabulous and the itinerary PERFECT. We were nicely surprised every day. We never felt rushed but we seemed to do and see everything. I’m asked what I liked best and I just can’t pick a favorite day. Each was as nice but different than the next. Thank you for the perfect adventure. "A simple thank you note seems inadequate for the integral part you played in our recent trip to Ireland and Plymouth, England. Your willingness to be our tour director, with no detail left to chance, was above and beyond our expectations. Our accommodations were wonderful, the venues you provided for us to share our music with the UK were perfect. Our bus drivers and guides shared not only travel assistance, but also colorful insight into the areas we visited. This was a delightful experience that will live on in our photos, videos, DVD's and our memories. Leo, on behalf of the Rich-Tone Chorus let me say thank you to you and your company for their help and of course their patience - your TLC Tours are aptly named. We hope the occasion arises in the future when we will avail ourselves of your services once more. "The October 2001 tour was a very touching and memorable experience for the members of the River Magic Chorus. What a unique and exciting opportunity we had to represent Sweet Adelines International as the first American chorus to compete at the IABS convention! Thanks for the chance to make history and to sing barbershop music to so many appreciative audiences. We were humbled by the fact that the Irish people thought we were "brave" for traveling after the tragic events of September 11, 2001, and were so supportive of us with many hugs and kind words. Had it not been for the active support of TLC Tours and Leo Larivee, we may have opted not to travel. Thanks for a great tour and the experience of a lifetime! Let's do it again real soon!" "Wow, we had a great time! We were very pleased with the way things went and we certainly met a lot of good folks, both Irish and tourists. We look forward to seeing you again and the possibility of new adventures together! Many thanks for your hard work". "Thanks for the fantastic time in Ireland. It was a real treat for me. Everyone in the tour group was so friendly and certainly made us feel welcome. And the Irish people were all so very hospitable everywhere we went. I especially enjoyed the get-together with the children. The level of quality that they displayed was outstanding and a great tribute to the Irish musical heritage. It made my heart very glad to be able to share our barbershop style of music with the kids... I also enjoyed the choruses that were chosen to make the trip. Not only were they nice folks, the sang very well and took their craft seriously. Cornerstone was great. Very entertaining and really nice guys. The logistics of all the events were flawless. Seemed to be very well thought out. I liked the completeness of the itinerary and getting it ahead of time. Tom, our tour guide was great. Knowledgeable, funny, caring and very personable. Very good at his job. Leo, thanks again for an awesome trip. I was very glad to be a part of it and I hope our paths cross again." What Do Ireland Travelers Say? "It was great not having to worry about where to go, and what to see, since all that was taken care of for us. This was a most memorable trip. The fact that we were ambassadors for our Society made it even more special. In addition, it turned out to be a great bonding experience for all of my chorus members and their families. An unexpected benefit! You won't find a more friendly and personable tour manager than Leo Larivee." "I liked best the way everything was organized and most of our time there was utilized. Our driver, Tom, was an excellent source of information and he made everything we saw and did very exciting. He answered all questions very amiably and he was a very likable person. The other drivers would have to go a long way to surpass him. The Larivee Company went out of their way to make sure we were not only comfortable but that anything that we would enjoy doing was in the plan. (Much singing for example). The Tralee Festival, the Skerries interchapter and the Westmanstown interchapter were all fantastic. It was a big thrill to sing during Sunday's services at St. Mary's Cathedral and also to sing at St. Patrick's Cathedral. The food was excellent as were the hotels. The Knappouge Medieval Banquet was very impressive. I did not enter any negative comments because I didn't feel negative about anything on that tour. I'd like to add a note. I misplaced my Minolta camera at the Shannon airport. After I arrived home, I sent an email off to Leo and he immediately had them put a trace on it. Two days later, my camera was located at the duty free counter. Leo, on his next trip, will pick it up for me. Thanks again, Leo. I'm sure the old saying goes for all of us from Binghamton. A GREAT TIME WAS HAD BY ALL." It was a great trip...everyone had a good time, and many will want to travel with us again! Thanks! If ever you need a reference, I'll be happy to tell all about the luxurious accommodations, the fabulous sightseeing and shopping experiences, the delicious meals, the fun and informative tour guides, the exciting performances, and the relaxed and congenial social interactions among the tour group and in its visits with local Barbershoppers! Couldn't have asked for more!